GVS9000 7XU Pro 16xSD/HD-SDI is a cost effective, easily integrated Real Time serial (9-pin RS422) controlled solution compatible with a number industry standard controlled systems. Share 16xGVS9000 1XU Pro with native file format support in one common Nomadic1U 12xPro Redundant storage for all RAW Uncompressed HD 1920x1080i/p 60 frame sets as well as a large number of industrial supported user selectable codecs' MPEG2, MPEG4, ProRes, DVCPRO HD, HDV, IMX, XDCAM, DNxHD, IMX, JPEG, and DPX, Film Production, Live Event, Sports, Post House, Medical, Science, Security, Education, and Defense environments. Capture direct from camera (SD/HD-SDI, HDMI, YUV) with optional 3G interface. The GVS9000 7XU Pro performs accurate live capture and playback, with network control, RS422 and frame accurate control matched to the original feed with a number of AES and embedded SDI audio. Multiple input and output feeds can also be configured. Ingest up to 16 channels simultaneously with the option to select from the list of any of the 16 recorded channels for regular or slow-mo playback. Fully compatible with VDCP automation protocols, as well as RS422 from any recording channel and LTC, with genlock. • Supports uncompressed HD and 5Mbit-3.0Gbit/sec codec's to select format. • Supports 7,8,12 and 16 full bandwidth 4:2:2 10-bits (12-bit capable) for 1080i, 1080p, and 720p formats. 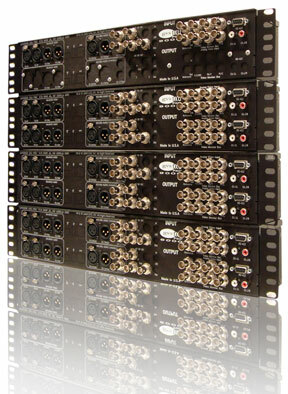 • Convert between 4:4:4 and 4:2:2 formats for single link HD-SDI output. • Easy access over gigabit or fibre without having to move media. Video Server with 7 record and 7 play channel. 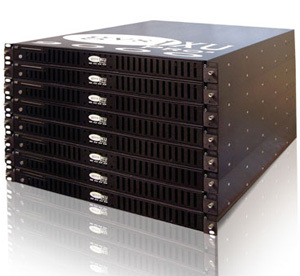 The GVS9000 7XU Pro is a rugged, low profile, rack mountable, multiple format video server that occupies less than 21 ” deep and 7U high rack space. It’s an innovative, completely ruggedized system, designed with open architecture and extreme low power consumption, providing users the ability to operate the recording in a large number of environments. 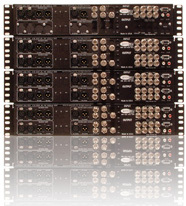 Users can quickly capture single clips 12 hrs in length with Uncompressed HD format up to 16xConcurrent recorders or data rate from 5MBit - 3.0 GB in either manual or controlled mode with a large number of industry video server controller support with the highest quality and all the benefits that digital recorders offer. With GVS9000 Controller Pro remote you're able to insert last minute ads or specific news into the current playing program system. For online storage, the GVS9000 7XU Pro is designed to work with the latest Nomadic and other Shared storage product technologies. Connect via fibre channel or gigabit the Nomadic 12xPro, Nomadic 4U . A complete solution from ingest, storage, and edit to broadcast in a single format with a wide range of post production workflow options, reducing the time required and offering real-time playback at various serial device controlled. Eliminate tape transfers using real-time technology without rendering video effects to disk. - Saves 2 HOURS of transfer time per hour of material, allowing a audio/video editor to immediately start working against new cut, while video is being captured. - Start editing in Eduis, Premier, Final Cut Pro, Avid, or other editing applications while additional material is being captured and while edited material is playing back. - GVS9000 7XU Pro DDR Capture can perform very long captures without stopping, during which you can review, log or edit the incoming video and audio. - GVS9000 7XU Pro DDR offers synchronization of all the input and output ports. - Easy integration with remote control via third party controllers, i.e. SonyP2, VDCP, and Odetics protocols supported by a number of manufacturers. - Multi machine lock immediately after pressing play, no slowing period, multi- machine synchronized playback as well as TCP/IP network interface. - GVS9000 7XU Pro can also be used for basic sub-clip logging, using a highly responsive GVS Control jog shuttle controller. - Multiple sources of QuickTime, AVI, DPX, JPEG, material can be played back in sync, without transferring to another medium, like DVD or Tape. - GVS9000 7XU Pro DDR configuration is extremely flexible, supporting almost any setup you may ever need. Sync to external TC, generate timecode, manual control with jog shuttle wheel, even run GVS9000 1XU VTR units off a multi-machine 9-pin synchronizer. - GVS9000 7XU Pro DDR units can be easily ganged together for multi-camera environments, and automatic file naming and embedding of identification metadata makes life even easier for video editors. -Similarly, GVS9000 7XU Pro DDR can help bridge the technology divide between heavy duty broadcast infrastructure, such as on-air video servers, and desktop production tools. By presenting Quicktime movies created in your video graphics department as a 9-pin controllable video deck, on air loading systems can upload material straight from GVS9000 7XU Pro DDR, just as if it were a digi-beta. Using this technique saves time, and money, since no transfers to tape are required, and no physical delivery from department to department. The Video graphics artist no longer needs to have an expensive tape deck machine.